Hastings councillors have called on East Sussex County Council to rethink the closure of a day centre for elderly and disabled residents. At a meeting on Monday (July 23), Labour-led Hastings Borough Council voted on a motion to request the decision to shut the Isabel Blackman Centre is brought back to county council cabinet members for a second look. The motion – put forward by Labour councillor Tania Charman – also criticised the level of evidence on which the closure decision was taken and called on the Tory-led county council to provide detailed plans for a ‘like-for-like’ replacement service. Cllr Charman, who is also a East Sussex county councillor, said: “Staff, volunteers, clients and comrades of mine, since 2010, have been in a battle against austerity. We have stood side-by-side at the mercy of a government who, it seems, know not when to stop. “The motion stands for more than IBC really. It stands for every older people’s service that has been lost to our town over a ten-year journey. The Moreton Centre in 2010, Pinehill in 2015, Conquest in 2017 and ARCC in Rye, which folded recently. All gone, and now it is IBC and the Charter Centre. “There is only one day care left intact in the directly-purchased services of the county – The Phoenix Centre in Lewes. Cllr Charman also criticised the quality of the consultation process saying there was ‘no clear mention of a closure’ and said she felt the report was lacking in evidence. While the motion was supported by other Labour councillors it was opposed by members of the council’s Conservative group. Matthew Beaver, who is also a county councillor, said: “It was no surprise that this motion is before us and it will be no surprise that it will pass tonight as there are 18 of you and, whatever we decide on this side, there are eight of us. That is democracy and it will go through. “I would like to take the opportunity though to ask you to consider a number of points before you en-masse vote on this. Will the Isabel Blackman Centre be closing? Yes, I hold my hands up to that. It is. Are the services this building provides stopping? No, they are not. 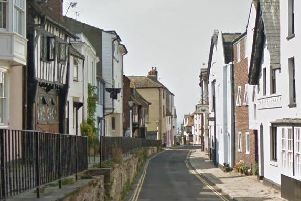 “The county believe they can provide those services at the same level of care at less cost, which in turn could then help more people both in Hastings and around the area. “Foremost though is the fact that at least part of this motion is impossible as neither Cllr Chowney as leader nor this council as a whole has the authority to refer this back to cabinet. Cllr Beaver also criticised Labour county councillor Trevor Webb for not attempting to trigger a call-in with the support of other councillors and the wider county council Labour group for not raising questions about the subject at a full council meeting earlier this month. Later in the debate Conservative group leader Rob Lee also criticised Cllr Webb. He said: “It is all very well for Labour to bring this up at Hastings Borough Council however at East Sussex County Council they remain mute on the subject. No questions asked at full council and your leader at East Sussex County Council has not called this in. “This is the person you are choosing to lead your Labour group in Lewes and he cannot call it back. Because why? Didn’t want to? Doesn’t believe in it? Couldn’t be bothered or doesn’t know how? In reply, Hastings Borough Council leader Peter Chowney said: “I’m certainly not taking any lessons from the members opposite, certainly not about who we should have representing us at Lewes and who we have as leader of the Labour group at the county council. “I have full confidence in Trevor Webb and I believe he is doing a good job there.